A video of Dennis Meadows, co-author of Limits to Growth, from the 2009 World Economic Forum meetings in Davos meeting where he reflects on economic growth, oil, and decline. 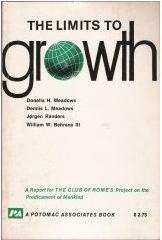 [he] served as Research Director for the project on “The Limits to Growth,” for the Club of Rome in 1972. Employing a system simulation model called “World3,” his report demonstrated that if certain limiting factors of the earth’s physical capacity – such as resources, the environment, and land – are not recognized, mankind will soon find itself in a dangerous situation. The conflict between the limited capacity of the earth and the expansion of the population accompanied by economic growth could lead to general societal collapse. The report said that to avert this outcome, it is necessary that the goals of zero population growth and zero expansion in use of materials be attained as soon as possible. The report had an enormous impact on a world that had continued to grow both economically and in population since World War II. The report sparked a great debate worldwide about the value of the zero growth theory that it proposed. The report was extremely significant in that it sounded a loud alarm about global society’s urgent need for sustainable development, and it engendered broad interest throughout the world. Since its initial publication, Dr. Meadows has continued to study the causes and consequences of physical growth on a finite planet. He co-founded the Balaton Group, a famous environmental research network. He has published many educational games and books about sustainable development that are used around the world. Together with his wife, the late Dr. Donella Meadows and Dr. J. Randers, he has twice co-authored updates to “ The Limits to Growth”, in 1992 and 2004. In these updates, an improved world model was used to point out that the limiting features of the earth’s physical capacity, about which “ The Limits to Growth” had sounded a warning, have continued to deteriorate, and that the time left for solving the problem is growing short; the authors also urged that mankind not delay in taking the measures necessary to address the situation. The Prize has posted an interview video on YouTube. …Contrary to popular belief, The Limits to Growth scenarios by the team of analysts from the Massachusetts Institute of Technology did not predict world collapse by the end of the 20th century. This paper focuses on a comparison of recently collated historical data for 1970–2000 with scenarios presented in the Limits to Growth. The analysis shows that 30 years of historical data compare favorably with key features of a business-as-usual scenario called the “standard run” scenario, which results in collapse of the global system midway through the 21st century. The data do not compare well with other scenarios involving comprehensive use of technology or stabilizing behaviour and policies. The results indicate the particular importance of understanding and controlling global pollution.